Yesterday, T-Mobile announced that it would be launching a new Simple Starter plan, giving customers the chance to get quadruple the data for just $5 extra per month. Instead of paying $40 for 500MB of data, subscribers can now sign up for 2GB and pay just $45 per month. And the company wasn’t done there. Today, T-Mo has announced a couple of new initiatives. One we already knew about, and other we didn’t. From September 3rd, customers can add a tablet to their postpaid Simple Choice plan for just $10. Whatever allowance they get on their plan, T-Mo will match it on the tablet. So if you have a 5GB Simple Choice plan, you’ll be able to get a tablet with 5GB added on for just $10 more per month. This is true of every Simple Choice tier up to the $70 5GB plan. Using that plan as an example, you’ll pay $80 per month and have a smartphone and a tablet and 5GB of data to use on each device. Let’s not forget, you still get the free 200MB data every month, for the life of your tablet plan. As you can see, when you compare similarly priced plans on the other three major carriers, the data allowance is huge. If you’re an unlimited plan customer, sadly, you don’t also get unlimited on the tablet. From the way I understand it, you will also get 5GB of data to use on your tablet should you decide to pay the extra $10 for a tablet line to be added to your account. These new plans go live next week, on September 3rd. 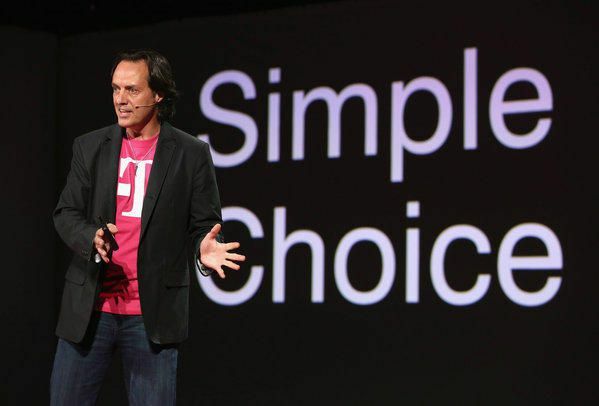 We’ve been banging on about this for weeks now, but, T-Mobile has officially announced that customers will soon be able add up to 10 lines to their Simple Choice family plans. T-Mobile is expanding its simple, low-cost pricing from a maximum of five lines per account to 10, in response to the needs of families and small businesses. These changes were launched (very quietly) last week, and today is the first time T-Mo communications have acknowledged the fact you can now get more than 5 lines on your account. So does this mean that after the first line, which is $50 per month, that each additional line is now $10 per month? That would mean that for 10 lines, one would pay $140 per month! That would be amazing (and a steal) for unlimited talk, text, and 2.5GB of LTE data per line (reverts to 1GB after 2015). Sounds too good to be true. Actually, $80 for the first two lines then $10 for lines 2-10, so $160 per month for 10 lines. Sorry, I re-read the statement. They must have canned the idea of lines 7-10 being $20 per month per line. The 6Plus (Enterprise account) was like this – months ago. I thought they mirrored that. So the first and 2nd line is 50 & 30. Third to Sixth line is 10. EDIT: lines 7 to 10 are $20. That’s what I’m wondering as well. I have 2x 1GB lines and a grandfathered $70 unlimited/unthrottled line. If I could just pay $10 to get 5GB (from that third line), I might actually just get a cellular tablet. I’m guessing they will ask who is getting the tablet. More likely you can tell them that its the one with the highest data plan. Can’t wait for more details. What about existing tablets on Simple Choice Plan? Do the same rules apply? Are Simple Choice Family plans included? I’d like to know too, though so far with John at the helm, they’ve included existing customers in plan changes… unlike Sprint. One of the reasons I like T-Mobile. I’d guess that existing tablets are covered. But since there are no contracts and you can bring your own tablet… If this isn’t the case you could always “drop” your current plan and then immediately add the tablet back again to be “new”. Of course, this is an easy workaround (if it comes to that) if you don’t have EIP to contend with. What about existing tablets ? I have unlimited data on my N5, with my LTE N7 3GB for $20 a month plus 200mb I’d love to get more data for $10 or even $20 a month. Should be fine as long as you have a postpaid simple choice phone, it doesn’t say new customers only. If they do give you a hard time since you already have the internet line, just cancel it and then add a new tablet to your plan. Can’t imagine your tablets phone number is at all important. Don’t forget, Sprint charges extra just to have tethering too. the other 3 carriers do not.. Wait so lines 7-10 aren’t $20? Seems to be some confusion on the cost of lines 3-10. The press release clearly states $10 per line after line #2. No, that’s what we read but it seems they are now $10 from 3-10. When all phones can tether, what is the point of a tablet plan? or.. the tethering could just mirror the plan. You pay for GBs either way. It’s like T-Mobile wants to flirt with being awesome, but just can’t bring themselves to truly commit. Because tethering is clumsy and awkward. Your tablet, like your phone, is supposed to be “always on”. Tethering adds an extra step where you keep having to monitor your device and turn tethering on and off on your phone, or eschew the always-on functionality completely. Plus constant tethering pretty much destroys your battery life. Bought a new tablet the other week with T-Mobile’s 4G. Much, much, more pleasant experience than the Wifi-only devices I used before. What’s so difficult about a button on the home screen to toggle Internet Sharing on or off? Everything else happens automatically once it is set up the first time. Clumsy and awkward? You need a better phone. I said clumsy and awkward, not difficult. It’s clumsy and awkward because it’s not automatic. It’s clumsy and awkward because it involves pulling another device out of your pocket so you can do things on your tablet. It’s clumsy and awkward because you have to remember that you’re using it or else risk your battery dying prematurely. It’s clumsy and awkward because you have to know when your tablet isn’t in range of Wifi so you can turn it on. I need a better phone? Can you point me at one that somehow automatically detects when my tablet’s lost Internet access, and automatically switches on tethering, somehow working out that the tablet is within range of Wifi and turning off tethering when that happens, and does so without draining the battery? Sure. My phone automatically turns off Tethering when it isn’t being used. If you connect your tablet to another WiFi hotspot it won’t be using tethering, and therefore it will get shut off from non-use. If _I_ connect my tablet to another WiFi hotspot, then I’m still manually configuring my network. Again, the idea is that this is supposed to be transparent, not requiring constant intervention from the tablet owner to ensure the tablet is online. BTW are you sure it’s not just switching off because of lack of traffic? I’ve had that happen with my Galaxy Nexus. This kind of auto-timeout actually adds frustration, rather than reduces it because you find the device offline when you expect it to be on. I guess I’m ok with a lazy tax for you. Just leave a decent tethering option for me. Lazy huh? So you really are seriously telling me that you keep switching your tethering on every time you leave the range of your WiFi router, and back off when you come home? What’s your phone’s battery life out of interest? An hour? The original question was “When all phone can tether, what is the point of a tablet plan?” You’ve got your answer. I wish you’d listen to it, rather than pretending that tethering is a realistic way to ensure your tablet is always-on. I switch tethering on when I need to access the internet on a tablet and there is no other connectivity option available to me. That isn’t all that often, surprisingly. I don’t have to switch it off, it does that itself. I have also taken to traveling with a Roku and using that with the TVs in hotel rooms so I have my own entertainment box with me instead of their crappy channels. Hotel WiFi doesn’t work so well with streaming all the time so I also tether that pretty often. Tethering is just more flexible all around. The impact to battery is there, but it isn’t bad. My phone usually gets 20 or so hours between charges, if it is a high use tethering day that might drop to 12-15 hours. Sure it’s an impact, but it isn’t world ending or anything. I get the impression from this message you have no idea what the benefits are of always-on and probably only use your tablet for surfing the web. Which is fine, but please don’t accuse people who make use of their tablets more than you do of being “lazy”. And as for your defence of tethering for something other than a way of occasionally accessing the Internet with your tablet, you’re arguing against a strawman. Nobody’s said tethering is wrong. What we’ve said is that tethering is a clumsy and awkward “solution” for those who need always-on service in a tablet. It is. I have a setup that does all of that automatically via tasker. 2) tablet does a scan for recognized networks, and sends an NFC blast if it does not find one. 3) phone recognizes the device’s identity via NFC signal and activates hotspot. 4) tablet connects to phone’s hotspot, and I’m on the internet in about 10 seconds. Still not as automatic as having a tablet with its own connection (both devices need to be within range, phone battery depletes fast, 10 second delay from opening tablet to actually being connected) but for cheapos like me its a very good alternative. That’s a nice idea. It doesn’t quite solve the problem (while the screen is off the tablet has no access in your scenario, and of course the battery life problem is still there) but it’s a good poor-man’s alternative to having an actual 3G/4G radio in the tablet. I have a 4g tablet, but don’t pay for data – its on the 200mb free plan. I still get push notifications and everything when the hotspot isn’t active, and 200mb a month is way more than what I need for that purpose. Then, when I’m actually using it, it automatically switches to my phone’s unlimited plan. I average about 30gb a month on my phone, 10-15gb of which is tethered. There isn’t a plan offered that would suit me anyway. Sounds like you need a better tablet as well. Wifi Hotspot is not clumsy or difficult at all. You’re aware of a tablet that magically enables the Wifi hotspot in a nearby mobile phone and tethers to it automatically whenever it loses nearby Wifi coverage, drops the tethering when it finds Wifi coverage, and also diverts power to the nearby mobile phone (zombie Tesla would be interested in this) while tethering so the phone doesn’t use up all of its battery within a few hours of this? Tell us more! Who makes this magical device? On iPhone and iPad running iOS 8, Wi-Fi hotspot is actually very simple to do. But regardless, there are some very compelling reasons to get a tablet plan. 1. You get 200MB per month for free from T-Mobile. 2. In my experience, Wi-Fi hotspot drains battery more quickly from the iPhone as it must keep the connection active. 3. On the iPhone, Wi-Fi hotspot triggers green status bar, which occupies rather substantial amount of screen real estate. 4. If you are on the 1GB plan, it’s better to spend $10 and upgrade your iPhone’s plan to 3GB and enable hotspot. But on 3GB and 5GB, you get more total bandwidth by spending $10 for a tablet plan. Would be nice if you could have separate billing responsibilities also. One of my 4 lines left because of this even though nothing bad happened payment wise. They just wanted to be on THEIR plan. So I moved them to cricket. Awww….I’m on the $70 Unlimited data plan. Too bad I don’t get UNL data on the tablet, should I choose to add one. Good try though T-Mo! You’re the best!!!! 5GB is still a great amount of data for only $10 a month. So, is this Uncarrier 7.0 or can we expect another surprise soon? no love for the unlimited simple choice folks? you get 5GB what more do you want? Neat deal for simple choice, I hope that keep the standalone plans relatively cheap though. I like my grandfathered voice plan and I have the tablet on 1gb simple choice, which is all I really need. Hope it stays at $10 for that too. I hope uncarrier 7.0 come with an app for WiFi calling for unlocked devices so we can all benefit fom. What if we want more than 5 GB on our tablets? Pay more. It’s just very costly for those one week or one day additional data plans. Any news on Tmo 700mhz? As a side note, T-Mobile’s family plan unlimited (4+ lines) is less expensive that Sprints. Sprint’s $60 Unlimited plan, with 4 lines, rings in at $240. I’ve got 4 lines on my plan, all of us unlimited. At the +$20 grandfathered pricing, we pay $180 including the 2.5GB tethering. Even under the current +$30 setup (with 5GB tethering!) it comes in at $220, $20 less than Sprint. That will probably be next. This underbidding has a lot of potential for people to save a lot of money. Are the credit classes (A, B, C & D) still being taken into consideration in reference to adding more than 5 lines still? Heck yes! I love having quadruple something I can’t use! I’m with you. I’d love to see T-Mobile start getting into the home internet business, maybe offering a mobile hotspot plan at $50 for 50GB per month? There are a lot of cord-cutters out there who have no landline telephone or cable TV, but maintain a hard-wired internet connection for work and entertainment. A viable hotspot plan to replace home internet would do pretty well. But who likes home internet connections to be capped? A cord cutter would go through 50GB very quickly. No carrier in US has enough bandwidth to offer 50gb for $50. did T-Mobile stop throttling? I am over my 1Gb but I am still getting 10mbps down. Are you using speedtest.net to get those figures? Those tests will never be slowed down because their traffic is on the whitelist. The ookla Speed Test app is white listed by T-Mobile, this means that even though your data is throttled, the app will still show your “true full speed” and not the slower “throttled speed” the app is also white listed from using your data, so each test you run does not impact your data usage. That explains it. How do you know this if you don’t mind me asking? Thanks. Question: What does this mean for the free data for life thing? Is this a way to offically add a tablet access fee to plans? Or was there always one? It’s nice you get 5GB, but I just tether with my 3GB from my smartphone. I’d hate to later upgrade my tablet line and lose my free 200MB (via the $10 credit for having a voice line) and be charged for it. Shouldn’t do anything to the 200MB free for life. That’s technically a $10 plan on your monthly bill, but you get an automatic $10 discount since you have a voice line. Does anyone know if this is strictly for “tablets”? What about mobile hotspots? I don’t need another tablet, but a mobile hotspot would work great with the 5 laptops and 4 tablets (all wifi-only) that my family already owns.